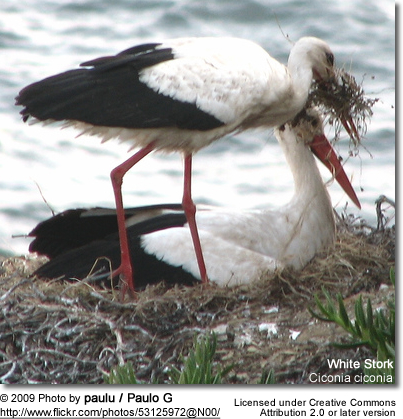 The White Stork (Ciconia ciconia) is a large wading bird in the stork family Ciconiidae, breeding in the warmer parts of Europe (north to Estonia), northwest Africa, and southwest Asia (east to southern Kazakhstan). It is a strong migrant, wintering mainly in tropical Africa, down to the south of South Africa, and also in the Indian Subcontinent. Ciconia ciconia ciconia Linnaeus, 1758. Europe, northwest Africa, westernmost Asia; wintering in Africa. Ciconia ciconia asiatica Severtsov, 1873. West-central Asia; wintering in India. The Oriental White Stork (Ciconia boyciana), now regarded as a distinct species, was formerly treated as a subspecies of the White Stork. It is a huge bird, 100-115 cm tall, with a 155-165 cm wingspan and a weight of 2.3-4.4 kg. It is completely white except for the black wing flight feathers, and its red bill and legs. It walks slowly and steadily on the ground. 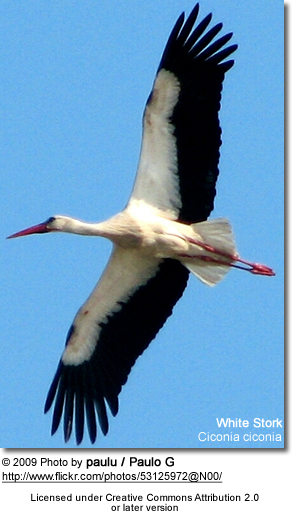 Like all storks, it flies with its neck outstretched. 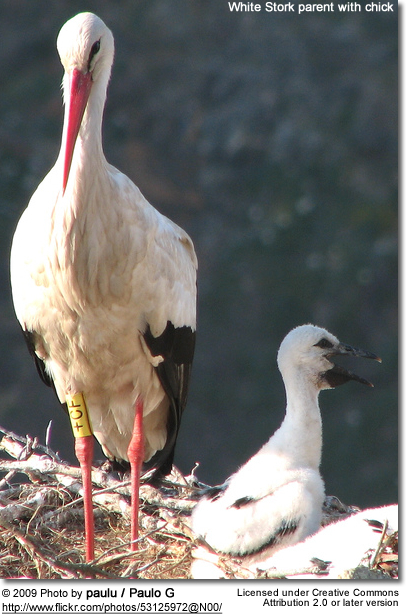 Notable breeding totals occur mainly in eastern Europe, with 40,900 pairs in Poland (5th International Census of White Stork, 1994), 12,000-18,000 pairs in Ukraine, 10,500-13,000 pairs in Belarus, 10,000 pairs in Lithuania, the highest known density of this species in the world, and 8,500 pairs in Latvia. In Germany, 3,000 of the total 3,400 pairs are in the former East Germany. In southwestern Asia, Turkey has the highest population, with 15,000-35,000 pairs. Apart from Spain (14,000 pairs) and Portugal (1,000-2,000 pairs), numbers in western Europe are much less healthy, with the once sizable Danish population declining to just five pairs in 1995, while re-introductions of zoo-reared birds have halted declines in Italy (30 pairs), the Netherlands (9-12 pairs), and Switzerland (120-160 pairs). A few pairs also breed in South Africa, recent colonists from within the normal wintering population (HBW). North of the breeding range, it is a rare passage migrant or vagrant in Finland, Great Britain, Iceland, Ireland, Norway, and Sweden, and also west to the Azores and Madeira. Data (except Poland and South Africa): Snow and Perrins 1998. Threats to the species include the drainage of wetlands and other agricultural intensification, collisions with overhead power lines, use of persistent pesticides (such as DDT) to combat locusts in Africa, and (largely illegal) hunting on passage and the wintering grounds (HBW). Some birds, known in German as Pfeilstorch ("arrow storks"), have been found in Europe with African arrows embedded in their bodies. The White Stork is one of the species to which the Agreement on the Conservation of African-Eurasian Migratory Waterbirds (AEWA) applies. The White Stork is a broad winged soaring bird, which relies on moving between thermals of hot air for sustained long distance flight. Since thermals only form over land, storks, together with large raptors, must cross the Mediterranean at the narrowest points, and many hundreds can be seen going through the straits of Gibraltar and the Bosphorus. 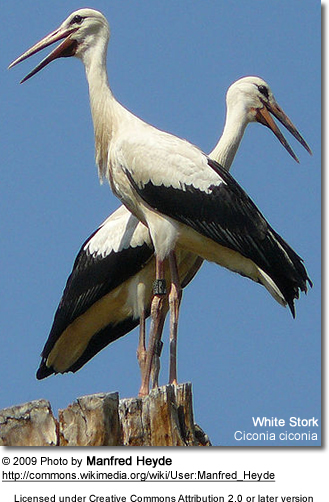 These storks breed in open farmland areas with access to marshy wetlands. It builds a stick nest in trees, on buildings, or special platforms. Because it is viewed as bird of good luck, it is not persecuted, and it often nests close to human habitation. In southern Europe, storks' nests can often be seen on churches and other buildings. It often forms small colonies. Like most of its relatives, it feeds mainly on frogs and large insects, but also young birds, lizards and rodents. It is almost silent except for the noisy mutual bill-clattering when adults meet at the nest. According to mythology, the 'stork' is responsible for bringing babies to new parents. This story probably came about because White Storks have a habit of nesting on buildings in urban areas, so they are often seen around human habitation. 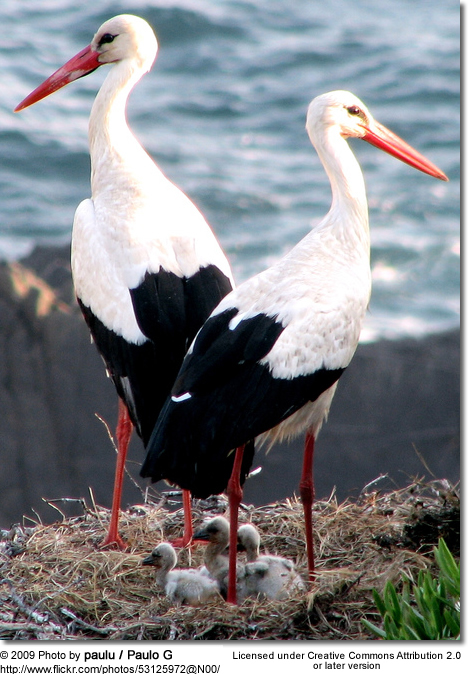 Lithuanians and Poles believe that storks bring harmony to a family on whose property they nest. 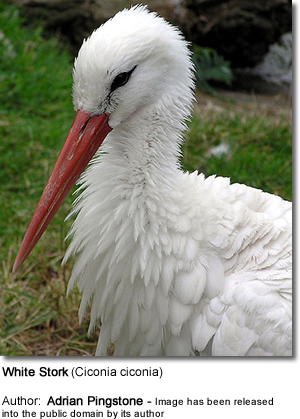 The White Stork is the national bird of Lithuania. It is also - set against a yellow and green background - the symbol of the city of The Hague, The Netherlands.